Swansea City chairman Huw Jenkins is in South America as he steps up the search for a new manager, with Argentina's Marcelo Bielsa the odds-on favourite. He led Spanish club Athletic Bilbao to the 2012 Europa League and Copa del Rey finals before a 2014 move to Marseille. Swansea parted company with Garry Monk on Wednesday and are thought to want a new boss before Sunday's West Ham game. Monk left the club following a run of just one win in 11 Premier League games. AEK Athens boss Gus Poyet was thought to be in the frame to replace him, but the Greek club said that they had not received an approach from Swansea regarding Poyet. Sevilla manager Unai Emery has also been linked with the job. Swansea's first-team coach Alan Curtis was in caretaker charge of Saturday's 2-1 defeat at Manchester City. 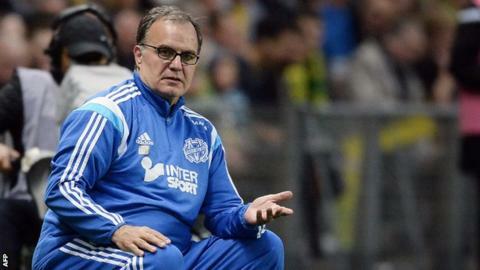 "Bielsa is one of the most influential coaches of the modern age. The characteristic thing about Bielsa teams is they want to attack. They want to play high-tempo; high-intensity football in the opposition's half of the field, which makes them very exciting to watch. If Swansea do manage to close this deal, which with Bielsa is by no means a foregone conclusion, that's what Swansea fans can expect - high intensity, high pressing and very ambitious football."